Farmhouse shandy is an incredibly refreshing craft beer cocktail that brings together the loose concept of shandy and the even looser style of saison (farmhouse) ale. There are no strict rules surrounding it. It is very much open to interpretation and you have complete freedom in your choice of saison and soda. I guess it is safe to say that it is a loosely defined cocktail. Let’s look into making one version of farmhouse shandy using saison ale. It is particularly difficult to classify them if it weren’t for one main ingredient that gives them their modern day key traits – yeast. Saisons originated in the Southern half of Belgium as low alcohol hydration intended ales brewed right before the weather warmed up enough for work in the fields to commence. The farmhands wanted something thirst quenching that they could drink a lot of on hot summer days and be able to continue working. 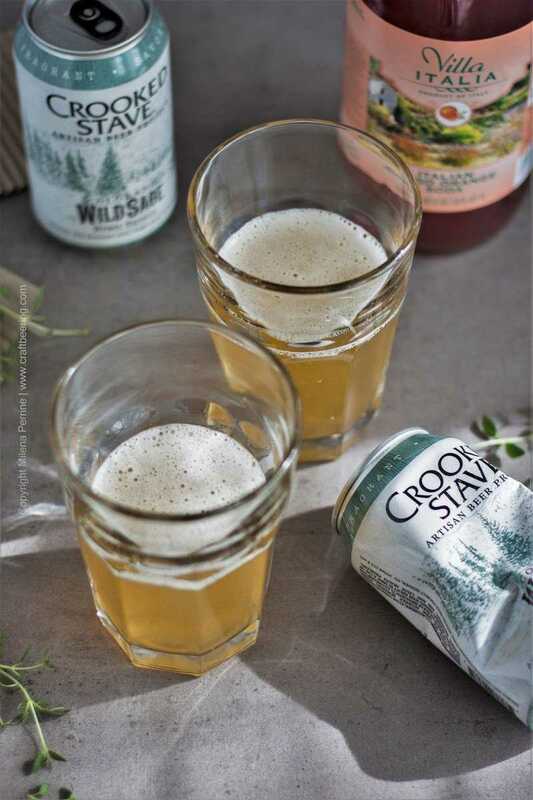 Modern saisons are often brewed with grain bills that result in much higher alcohol by volume content and are therefore very suitable for a sprightly dilution courtesy of fruit flavored sodas. The ratio between saison and soda is up to you. Consider the alcoholic content and exact flavors of the particular saison you are using and match it with a suitable soda. 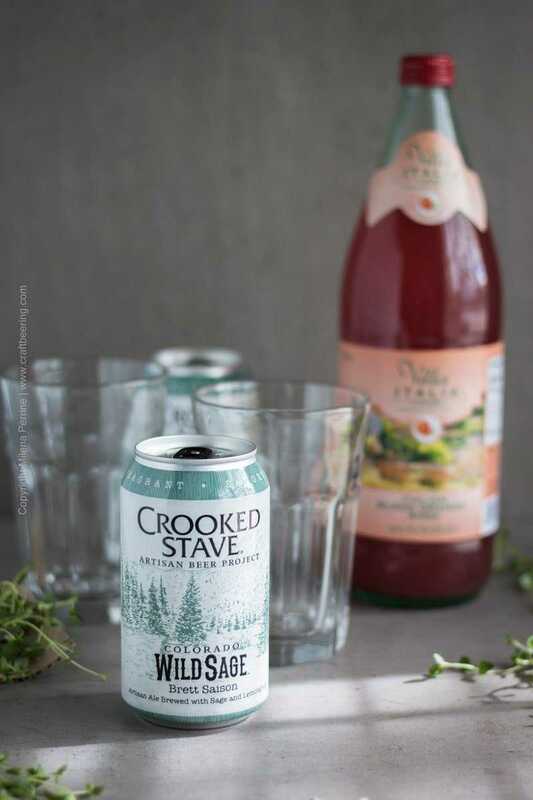 For example I used Crooked Stave Colorado Wild Sage Brett Saison. It is an artisan saison brewed with sage and lemongrass and fermented with a strain of Brettanomyces wild yeast. Plenty of funk, plenty of tartness and ginger and a bit of orange accompanied by distinct lemongrass. Herbal and grassy notes and a pronounced spicy finish. Medium mouthfeel with ABV 7.2%. As a farmhouse shandy ingredient definitely a potential partner for a citrusy soda. I picked blood orange. Pour the saison in each glass first and then add the soda. 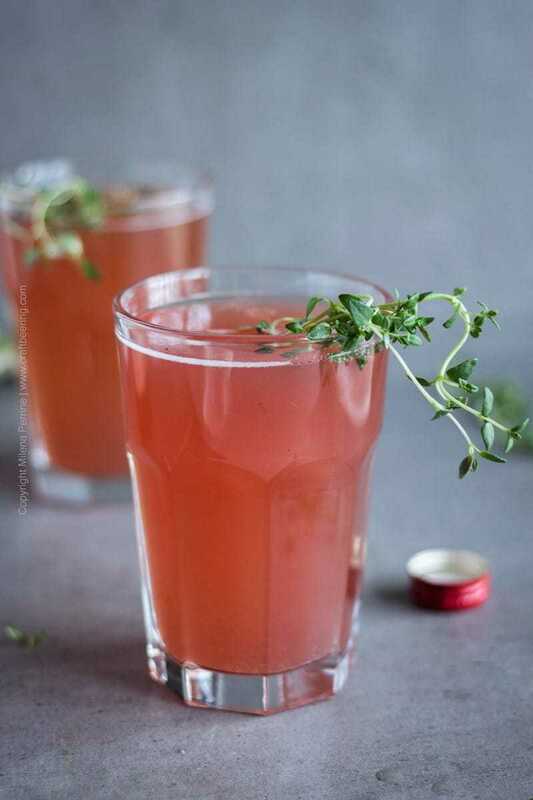 I am assuming you will not be drinking alone, but if so – good for you and cheers! Ratios wise, iff you follow the guidelines of the radler you’d go with a half and half ratio. Or if you prefer a more minimalist approach you can go with just a splash of soda as I mentioned in our grapefruit shandy post. My favorite approach to farmhouse shandy is to use just over three quarters of saison to a quarter of soda (3:1 ratio) mostly because most sodas are usually too sweet for my taste. Unless I score a San Pellegrino soda – dryer and with a less sugary flavor. Before hops saisons were typically bittered (flavored) with whatever bittering agents there were around the farm – flowers, herbs etc. 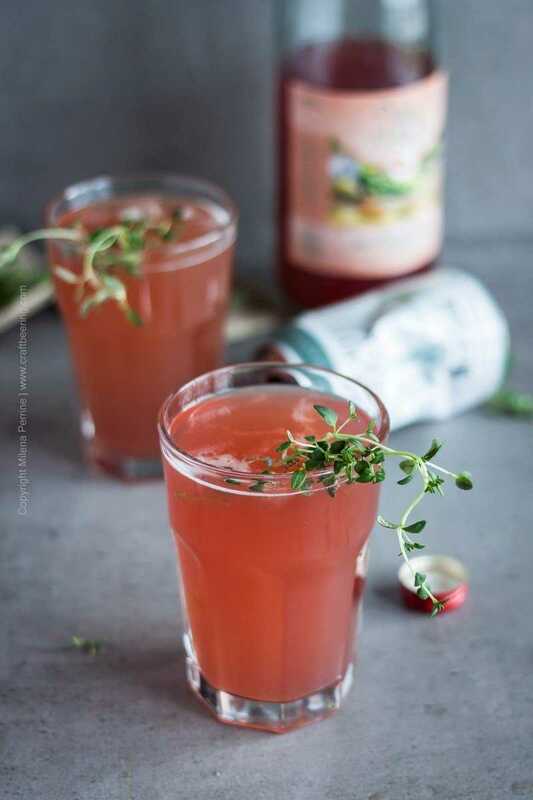 Herbal and grassy notes have always been a landmark characteristic of the style and opting for fresh herbs as garnish makes perfect sense. 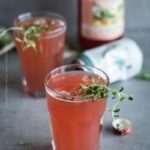 I love the delicate savory fragrance of thyme and chose it for the farmhouse shandy version in this post. Had I had an actual blood orange on hand I would have used it too. A lemon slice and a delicate sprig of sage is also a great combination for a garnish and I urge you to consider it. These are just a few tried and true combinations Chris and I really enjoy and recommend. I am sure that you can easily come up with more using your favorite saison as a starting point. This is really a libation you can drink all day. Not that I am promoting day drinking but if you are off and happen to be gardening under the sun all day or are planning on reading in your hammock under a tree all afternoon… Just saying. Farmhouse shandy mixed with Brett saison and blood orange soda. Refreshing and light. Adjust proportions as per your liking. 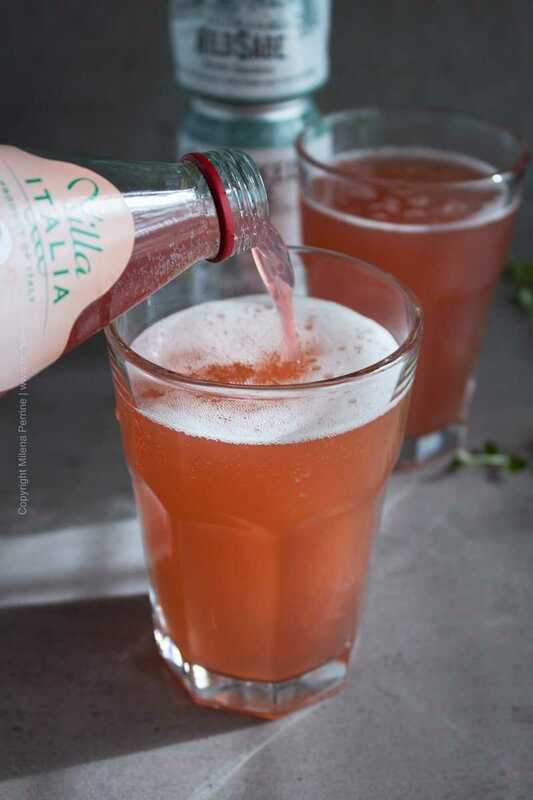 Substitute blood orange soda with your favorite Italian style soda. Chill both the saison (farmhouse) ale and the soda. Pour the saison first, then add the soda. The ratio of saison to soda is according to personal preference - half and half or 3/4 saison to 1/4 soda are a good place to start. 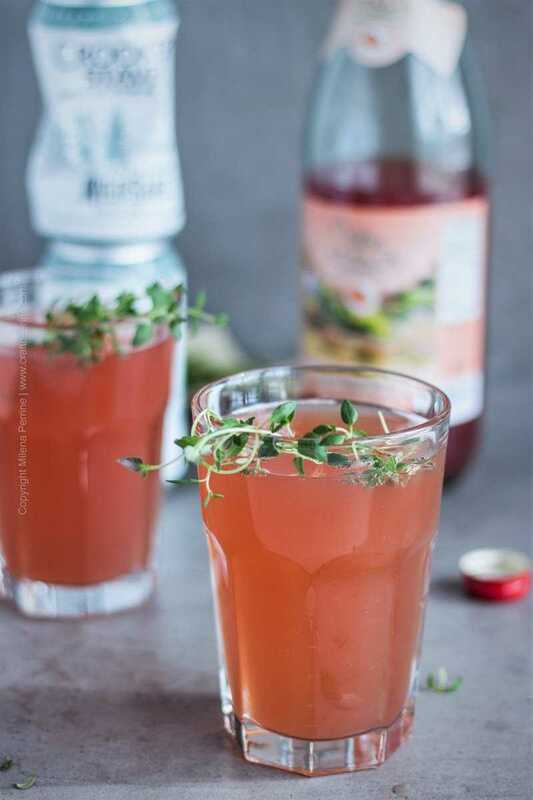 Garnish with a sprig of savory herb. Just the drink I need to go with that Fried Cauliflower!!! Now this is a shandy I think I’d like! And I love saison – thanks for sharing at the What’s for Dinner party. Hope you have a wonderful week! We are kindred souls:) Saison is such a favorite of ours! I’m not usually a beer drinker but this sounds really interesting… especially once the weather gets really hot. This looks ideal for the long weekend! I’m in Oregon right now and it’s been kind of gray, but we’re headed up to Washington tomorrow and (oddly enough) it’s nicer up there. I’m adding the ingredients to my shopping list now! Have a great weekend!